We have been in the river fishing the Walleye since the start of April and let’s just say that the start of the month had some pretty nasty weather to start the season. We had to reschedule some of our trips as we didn’t want to punish you guys. However the weather and fishing have made a nice turn around, while many of the big hens are spawned out already there are still some nice big fish being caught. The action as of late has been amazing with limits catch’s daily! The action and the weather is only getting better and now is the time to get out and try some of the best Walleye fishing in the country! The people at Sindbad’s have not forgotten how to cook these delicious fish either, so after you return and we clean your fish you should consider having them prepare some of them for you as they do a superb job! We have our big boats in the water and are starting our Bass trips now. 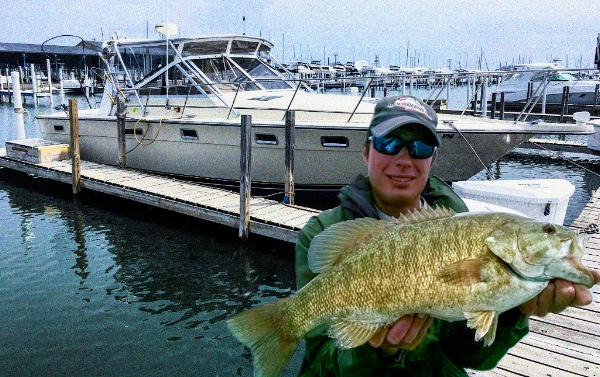 This early Bass season “catch & release” has some awesome action and has produced some very large smallies as well. These trips are great for people who want the “rod in hand” experience and is also great for kids! We still have openings during the next month but as things heat up our availability will become limited. Give us a call and let’s get out there.